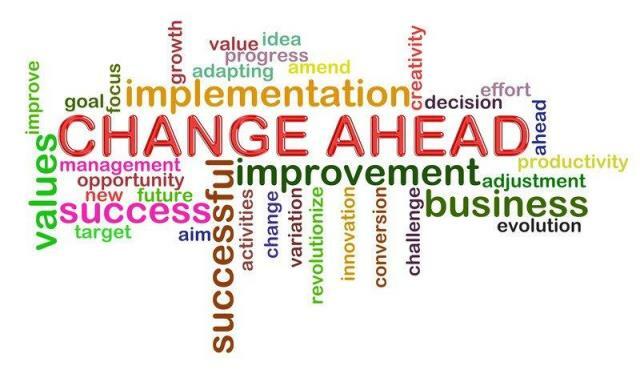 Wikipedia defines change management (as it relates to people) as “a structured approach to change in individuals, teams, organizations, and societies.” What the definition does not state is how significant change management can be in achieving successful outcomes. Maybe this is why so many initiatives fall flat, are wholly unsuccessful, take longer, and cost more than planned … the “planning” failed to address the human factors. Today, just about everything to do with running any business unit in any organization is about managing change. Think of the number of times you have had to react to an initiative in which you are the responsible party from an implementation perspective. Yet, you had no participation in the project prior to being asked to launch it in your business unit. I had a conversation with a man that shared a story about such a situation. He had received the “deck” he was to use when “sharing” a new organizational model about tobe adopted. He had no prior knowledge. The business rationale was not expressed and he did not feel capable of being the “messenger.” While the man was clear on the explicit tactical changes, he was blind on the strategic. This man knew that he would be pummeled with questions he could not answer and was very upset. When he approached the corporate communications group (a reasonable idea), the man was told that they only deal with communications with the press. They DO NOT communicate internally. How interesting. I wondered how many companies have an entire department of people dedicated to distributing change information to external parties while essentially no one has the task of actually distributing information internally for tactical changes that often accompany major changes. Think about it. I am often struck when I see sales initiatives in Contact Centers driven by some external department or new leader that thinks, “Why don’t those folks in the Contact Center sell more?” In many cases it is because those folks were hired for the purpose of providing service; the word “sales” scares them into rejecting the concept. (I’m not referring to environments in which agents are hired for sales positions. They know what they were hired for. The fact that they may not be any good at it is an entirely different subject). This is the time for change management. The reality is that introducing a sales program into a Service Center requires some additional time; it is time well spent. First, you must be incredibly clear on exactly what it is you are trying to accomplish. Is it better relationships, larger “wallet share,” referrals, and exposure or simply exploring additional revenue-generating opportunities? Be certain to frame it all up against the brand, the branded experience, your value proposition (i.e., your marketplace differentiators that have made your business attractive in the past), and other key business objectives. Ask yourself what kind of program this really is. Just for the record, one change I would recommend is that when introducing a selling aspect to a service environment, avoid using the terms “cross-sell” and “up-sell.” These may work in sales environments, but they represent an incredibly limited concept. The terms rarely inspire excitement and enthusiasm. Rather, think of introducing sales initiatives as part of an overhaul to improve the Customer Experience. The kind of program that works best in a service-to-sales operation is one that is launched within a “grace period” of perhaps three to six months. This allows skills to be tested, data to be collected, and expectations to be set. It also eliminates the creation of new objectives for “sales per individual” that is launched at the same time as the program. Effective change management removes the fear factor and allows time for “adoption.” It includes excellent customized training that uses the products and services themselves as the “weave-in” for future conversations. Contact Centers that bring in pure off-the-shelf sales training to facilitate service-to-sales operations are likely going to be disappointed. Customer Service agents do not want to learn how to overcome objections, recognize closing indicators, and all the other “canned” selling techniques. These are more appropriate for those that applied for and hired to sell. Successful implementations incorporate training programs that allow for a highly interactive environment built around the organization’s products and services. This allows agents themselves to identify features and benefits that callers would be interested in (not targets or prospects) and to validate throughout the grace period the methods that are of most value to the customer. Your program’s identity can be woven into what agents already do. For example, Banks and Credit Union Service Centers demonstrate this interwoven process when handling calls from the “overdrawn.” Agents know instinctively to offer “overdraft protection.” It makes perfect sense to the agent. The product adds value to the relationship the customer has with the institution, protects the customer from future predicaments, and is essentially free for the asking (only costing when a loan is distributed). If only it were that simple! PowerHouse strives to consistently exceed client expectations by providing incomparable service and superior process improvement strategies. Our full suite of consulting services helps clients determine their strategic direction, identify gaps between current and future state, and select optimum solutions.